The European Summit took place on 6-7 December and gathered around 2000 participants in 2 days. This year the event concentrated on the topic “Digital transformation of care”. In his opening speech, Roberto Viola, Director-General, DG Connect, insisted that this transformation delivers more opportunities since the cost for healthcare is constantly increasing, gradually overtaking the expenditure for pensions. He also advocated for a new way to consider care, focusing primarily on integrated care and on active communities that integrate technology into our environment. On the first day of the Summit, Markku Markkula, president of the Committee of the Regions emphasized that technological developments bring new expectations that we need to fulfill. 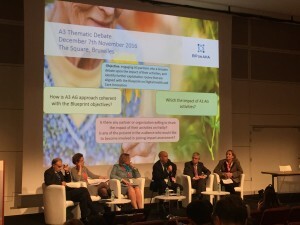 During the panel debate after the opening ceremony, the representatives from the industry who contributed to the Blueprint, a common vision in how innovation can transform the ageing society, urged to scale up the deployment of what we have already learnt. Martin Seychell, Deputy Director General, DG SANTE, reiterated that innovation is not only technology but also our care delivery systems and commended to put technology in this context. He also drew attention to the importance of regions, being the main drivers and implementers due to their homogeneity and closeness to its citizens. A recurring theme throughout the Summit was that digitalisation cannot substitute personal contact. In other words, innovation should go hand in hand with humanisation. Furthermore, health systems are too important to be changed top down and it is vital to involve healthcare professionals as well as patients in this complex process. One final remark was that we are not specifically building technology for the elderly but we need to apply the mainstream technology to their needs. Other debates during the Summit ranged from regional strategies to scale up innovation, smart housing, to free flow of health and wellbeing data, and removal of barriers to scalable markets. The second day of the event focused on the development of new models for public private partnerships for innovation in health and care. During the debate participants agreed that we can not solve problems with one acute action, instead we need patience and continuity. In Europe, we have good care providers which can be translated into capabilities, and in terms of budget, we have to be brave and invest in new industries in order to succeed. Furthermore, we need to create an adequate safety net for those who are likely to lose jobs due to technological disruption. The European Summit also gathered regional leaders of 74 Reference Sites across European Union. Many SUNFRAIL project partners were present and received awards for their excellent work in the framework of the European Innovation Partnership on Active and Healthy Ageing (EIP on AHA). The EIP AHA Repository of innovative practices is online and accessible at https://lnkd.in/dNcug_d. Further discussions covered mapping of investment in scaling up digital innovation across the EU, and linking IoT and interoperability of AHA solutions. In addition, the Summit included the presentations on Action Groups’ achievements under the EIP on AHA. The thematic debates were organised by EIP on AHA Action Groups & Reference Sites where each session included at least one Reference Site involved in the activities of the Action Group. On this occasion, several SUNFRAIL project partners were among the speakers. In the picture below, Prof. Marcello Maggio speaking at the AG A3 session, Prevention of functional decline and frailty.